After reading a post on the Bnet forums about which Pet Battle Dungeon could be next, I started thinking about what types of pets I'd like to see in the future. This piqued my curiosity about which pet families are underrepresented in our collections, so I looked it up. Here are the base results (from least to most, includes non-combat pets). It's quite shocking how few Dragonkin there are compared to Beast. Pet families don't *need* to be balanced across the board, but it would be nice to see these numbers brought up to a more even level. It was then noted that many pets have copy-pasted movesets. What would be the final count if those were not included? Would the numbers be a bit closer to each other? Here are the results (from least to most), not including pets that have the EXACT same movesets as one other pet. Unfortunately for Dragonkin, this makes the pool of possible pets in that family even smaller. Flying and Beast are still the biggest pet families. Last but not least, here are how the pet families rank if the non-combat pets are removed as well. There aren't huge changes, but Humanoid takes the biggest hit. So what's the conclusion? It's clear that some families are lacking in size, making the list of possible pets usable in a Pet Battle match smaller (and maybe making it more challenging as a result). Even when pets with the exact same moveset as one other pet are removed, the disparity between the least represented to most represented is more than 50%. It's likely the "right" situation or environment simply hasn't popped up yet to allow for more of certain pet types to be made available. Maybe, with some patience, we'll see the families with sub-100 pets increased in size. Keeping it short and sweet this year. I'm pretty much done collecting the Gnomeregan Pet Dungeon pets, but I wanted to leave this here for future reference in case I decide to go back. DMF balloon companions cannot battle and are not cageable. We're kicking off 2019 with a new PTR cycle. Patch 8.1.5 PTR is up and new Pet Battle content was added. Last but not least, 1 pet from "A Quest"
Some of my personal favorites/highlights of the RWL6 set. 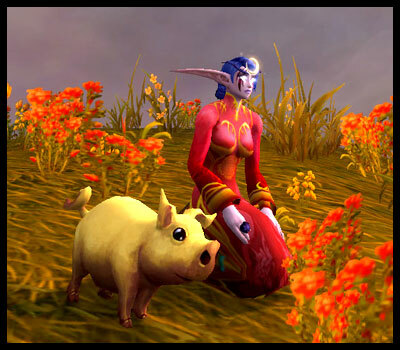 Full list of 8.1.5 datamined pets can be found here. The Pet Journal doesn't list specific bosses for the RWLVI pets yet. It's interesting that there are only 3 MoP raids listed for the achievement too. 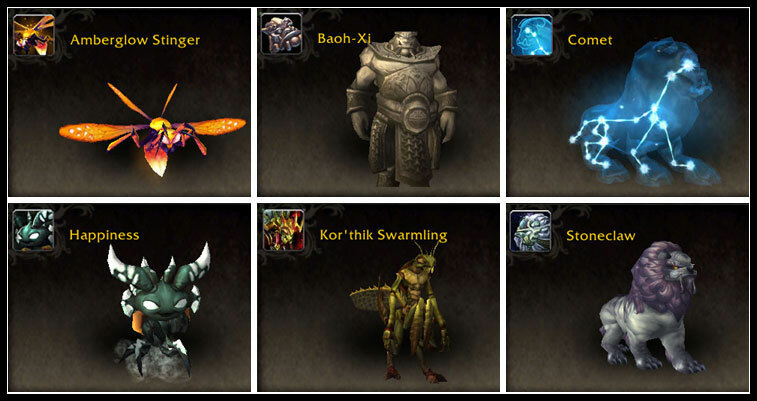 The last raids, Throne of Thunder and Siege of Ogrimmar are missing from this set of RWL pets. Will these 2 raids get their own RWL treatment? Or will they simply not be included? There are a number of pets that already drop from these raids, but we'll have to wait and see if they'll be grandfathered into RWL or if they'll stay as separate, standalone drops. Whatever Blizzard decides it may set precedence for future similar situations where pets are released as drops from raid bosses ahead of that particular raid's corresponding RWL achievement. The Brawler's Guild will also be making its return. No new pets from there so far, but the 2 previously released pets (Clock'em and Tylarr Gronnden) will be available again. Same requirements as before. That's it for now. They only announced the return of the Brawler's Guild and Children's Week updates during last year's BlizzCon preview of 8.1.5, but it's possible more Pet Battle content (even more than RWL6?!) could be added in this upcoming patch. We'll have to wait and see. Here is a list of duplicate Island Expedition pets that I have. Leatherwing Screecher - TY Rohannah! Rotting Ghoul - TY @ArchmageV! It's unclear if the non-mythic pets will drop on all difficulties, and if the Enchanted Tiki Mask enchanting recipe will drop on all difficulties. We'll have to wait and see. You can view the official Blizzard BoD raid preview and schedule here.